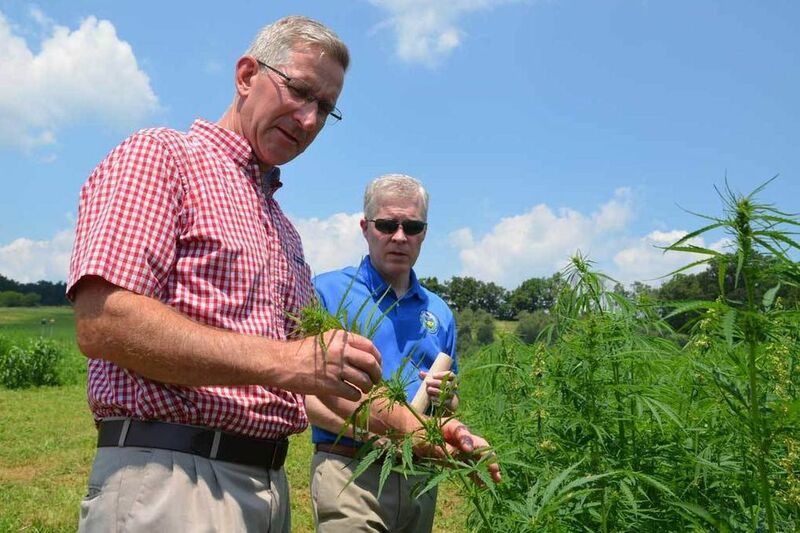 Hemp farming to expand exponentially in Pa.
Agriculture Secretary Russell Redding examines hemp plants with William “Bill” Evans, chief of staff for PA Senator Judy Schwank, at the Rodale Institute outside Kutztown, Berks County, on July 19. The amount of industrial hemp cultivated in Pennsylvania is about to grow significantly. The Department of Agriculture this month approved 39 research projects that will allow cultivation of about 1,000 acres of marijuana's non-psychoactive cousin. Last year, 14 growers produced a total of 36 acres of hemp statewide. In the southeastern region of the state, permission to grow hemp was granted to farmers in Bucks, Chester, Lancaster, and Montgomery Counties. Those cultivators will be required to pay a $2,000 permit fee. After the paperwork has cleared, the state Bureau of Plant Industry will submit orders for hemp seed to the U.S. Drug Enforcement Agency which must approve importation of the seed into the U.S.
Industrial hemp is grown for fiber and seed. It must maintain a concentration of the psychoactive compound THC below the 0.3 percent legal threshold.